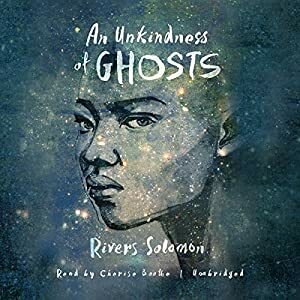 An Unkindness of Ghosts (2017), by Rivers Solomon, is a book that a lot of people will absolutely love unconditionally, a lot of people will love even as they hate reading large parts of it, and that will leave some people (cough cough this reviewer) a bit cold, which they will softly note while they keep their eyes down and move quietly for the exit. Despite falling into that last category, I’d still recommend Solomon’s debut novel for its stark depiction of a slave society that has too many echoes of our own world despite the sci-fi setting and for its diverse set of characters. The novel is a generation ship story, with the premise that the society sent out into space on the ship Matilda was a slave-based one (or regressed to one, it’s not wholly explicit, though I believe it’s the former), with the upper class whites living on the upper — more spacious, comfortable and luxurious — decks and the lower class darker skinned people living in the much more cramped, much more spartan lower decks. Matilda has been in flight for centuries, and we come aboard at a time of change thanks to a mysterious power outage and the equally mysterious death of the theocratic commander, known as the Sovereign. One more mystery arises via our main POV character Aster, whose mother supposedly committed suicide, but newly discovered (or decoded to be more accurate) journals seem to point to her mother discovering a major secret which now becomes Aster’s task to solve, a secret that may totally transform Matilda. Characterization is generally a strong suit in the novel, at least with regards to the main lower deck characters. While Aster’s neurodivergence may have its downside (more on that later), it’s conveyed in a richly detailed fashion such that one empathizes without sympathizing (i.e. one understands without the condescension of pitying). Her drive to learn, her hatred of the system and its purveyors, her love of order, her complex relationship with Theo and her mentally ill best friend Giselle, and especially her obsession with finding her mother’s “ghost” all make her a fully three-dimensional character. Theo isn’t quite as fully developed, nor is Giselle, but thanks to seeing them for at least a stretch of time through their own POV in addition via Aster’s, we do get a sense of their inner turmoil and thus they gain a bit more depth. The same holds true with Aster’s “Ainty,” Melusine, who is one of my favorite characters thanks to a POV where, in her job as the stereotypical “Mammy” — a role her “type” is often relegated to thanks to being “brown and dowdy” — Melusine spends most of her POV time telling us how she doesn’t like children at all: “I’m not the maternal type. Lullabies bore me. The idea of a child hanging off my breast, using me for sustenance, makes me very angry.” I loved the subversion of that entire scene. Nor does Solomon give us easy outs or wonderfully uplifting moments of rebellion and defiance. When defiance occurs, retaliation is brutal and devastating. And Aster is not going to be your typical spunky savior/chosen one. At one point, for instance, watching a horror about to unfold, she thinks, “This was the moment where Aster should stand, say, Take me instead. But she couldn’t.” I couldn’t help but read that as meta-commentary on how so many stories, particularly YA ones, offer those sort of moments up as cheaply easy and common (think Katniss when her sister is taken, for example). It’s one of those brilliantly pointed moments that are peppered throughout this novel. The upsides of An Unkindness of Ghosts outweigh the negatives, but I wish the gap had been greater than it was. While characterization, as noted, is rich and diverse, the nature of the characters creates a distancing effect, especially as so much is filtered through Aster’s hyper-literal and somewhat removed viewpoint. Part of me sees that as a plus (beyond the diversity aspect) because it allows Solomon to avoid either a distracting emotional response or overt melodrama. The horror is in some ways easier to look at through Aster’s filter, but it does rob the story of that direct emotionality. The same is true with Theo, as well as Giselle, whose psychosis mostly appears random and disconnected to plot and setting, at least until towards the end of the novel. The other issue with the characterization is that it is rich and diverse only amongst the lower decks. The upper deck whites are either hardly visible or wholly monotone with the occasional exception of a brief encounter with a guard who doesn’t fall wholly into the stock villain category. I didn’t necessarily need to see “good” upper deckers, just more complexity and more of a sense of their society, without it becoming “their” story. The world-building is a bit thin, though perhaps impressionistic is a more generous and fair reading of it. We get a few quite vivid, quite sharp details about some aspects, but much of the background — physical, social, economic, technological — remains vague. Genre readers will probably find it lacking while non-genre readers will most likely be happy with the sense of different dialects amongst the decks and the occasional description of a single physical setting, such as a field deck. And I think one has to take the premise as it is without thinking too much on it, or it risks falling apart. Accept the metaphor at the start, in other words, and don’t worry overmuch about whys or wherefores in terms of the social construction. This holds true as well for the religious aspect, which is somewhat tossed out there, is mentioned now and then, but is never fully explained, conveyed, or utilized and so it never feels real. The plot is a bit of a mixed bag as well. Sometimes things rely a bit much on contrivance or coincidence, or on the characters’ personal idiosyncrasies, and once or twice I made note of how I hate when plot is dependent on characters simply not speaking to one another. The mystery of what happened with Aster’s mother never has much tension to it; she sort of just goes along with various clues or necessary information kind of dropping from the sky for her so she can get to the required stages at the required time. And it closes I thought more than a little anti-climactically. And while the singular personal quest regarding her mother connects to the larger plotline about the tension between upper-deckers and lower deckers and whether or not this society will continue, the two storylines more fought against each for attention than worked in concert to enhance each other. Or at least, that’s how it felt to me. I read An Unkindness of Ghosts through in two sittings and while I never felt dragged forward — compelled by either character or plot — it kept me interested enough so that I never was truly tempted to stop reading, though I did start to feel a bit impatient by the end and was admittedly somewhat disappointed with the closing segment. 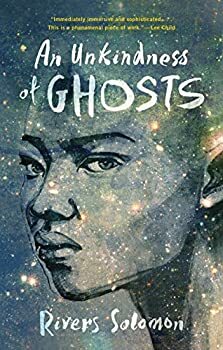 That said, thanks to the more-than-a-few brilliant moments scattered throughout the book, the captivating (and important) metaphor at its core, and the natural depiction of diverse characters, I’d recommend An Unkindness of Ghosts, and I especially look forward to what Solomon does next based on such an ambitious first book. I listened to the audiobook version of An Unkindness of Ghosts which was produced by Blackstone Audio and brilliantly narrated by actress Cherise Boothe. Boothe’s empathetic portrayal of Aster may have something to do with why I liked this book a bit more than Bill did. I loved the few wonders we witnessed (such as the nuclear power plant) and wanted to explore more of the ship. In a novel about one society being oppressed by another, I felt it was important to show me the societies. I got only the vaguest impression (a word Bill used) of the upper decks and didn’t fully appreciate the divisions between the decks / citizens. I would have liked to encounter some upper-deckers (other than Theo the surgeon) who were unhappy with the status quo. Don’t they exist? I had a hard time believing that the sovereign ruler of the entire generation ship would spend any time thinking or bothering about the petty antics of Aster and her friends, yet he did. 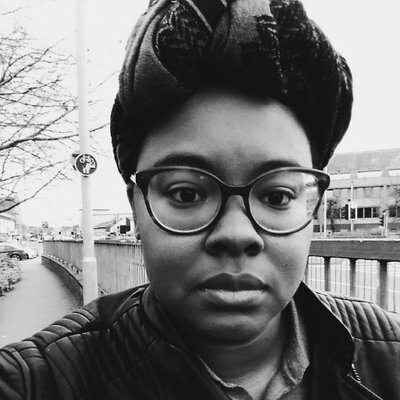 An Unkindness of Ghosts is about oppression, especially of people who are neuroatypical, not heterosexual, and not white, yet the story never takes backseat to an agenda and Solomon never becomes preachy. The story is a science fiction mystery that also shows us the unjustness of a society that isolates and oppresses those it deems outcasts. However, the steps to the solution of the mystery are not always clear (or believable) and I agree with Bill that the ending was not very satisfying, though I expect that many non-genre readers will disagree with us. Just like Bill, I was surprised by, and loved, the fact that Solomon chose not to make Aster and her friends heroes. This felt real, and sad, and I think that’s how I was supposed to feel. I felt that Aster’s unemotional matter-of-fact viewpoint, and Giselle’s psychosis (likely triggered by PTSD) enhanced the tragedy. Aster examined her new self in the mirror and said “I make a very dainty man.” She looked nothing — nothing at all — like a man she hoped she’d look like. One of those burley rough-faced types who walk the passageways of Matilda like a conquistador, each step a flag in the non-existent soil. Ainty’s POV, as Bill mentioned, was glorious, as were some parts where we see examples of Aster’s neuroatypicalness (such as the flashback scene with the camera). I also liked the contrast / juxtaposition of Ainty’s mythology stories with the real-world science that Aster practiced in her lab. An Unkindness of Ghosts is an impressive debut novel. It’s not surprising that it’s a finalist for the Locus Award for Best First Novel. I can’t wait to read what Rivers Solomon writes next. Published in 2017. Aster has little to offer folks in the way of rebuttal when they call her ogre and freak. She’s used to the names; she only wishes there was more truth to them. If she were truly a monster, she’d be powerful enough to tear down the walls around her until nothing remains of her world. Aster lives in the lowdeck slums of the HSS Matilda, a space vessel organized much like the antebellum South. For generations, Matilda has ferried the last of humanity to a mythical Promised Land. On its way, the ship’s leaders have imposed harsh moral restrictions and deep indignities on dark-skinned sharecroppers like Aster. Embroiled in a grudge with a brutal overseer, Aster learns there may be a way to improve her lot–if she’s willing to sow the seeds of civil war. My review was running long, so I left those aspects out, but I’d agree with Kat on the praise for the prose (Lovely and often startling in Word choice and metaphor) and the use of myth/stories (wouldn’t have minded seeing more of those), both of which I’d written down in my notes as highlights. So I don’t think it was just a good narrator. I’ve been curious about this book for a while, and after reading your combined thoughts, I think I definitely need to read it. Thanks for helping me make up my mind!